Why are The Surface Saver Urethane Snow Plow Cutting Edges Superior? for the snow plowing application. It has been specially formulated to withstand the rigors of plowing with added abrasion resistance, and a brittle point of -30º. Edges can be purchased in most lengths, widths and thicknesses. Work life can be doubled by choosing wider widths to provide the opportunity to drop the edge and then flip it as it wears. An optional beveled edge provides less chatter during break in. 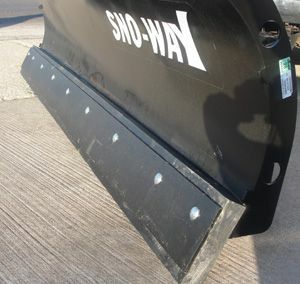 1 - 1 1/2" Thick x 6-8" wide - Underbody mounted plow and graders. Unsupported front mounted plows and graders. Outlasts Rubber by up to five times. Will not damage roadway markings, reflectors or cobblestone. Blades can be custom made to your specification. NO LIMITATIONS - Deal directly with the manufacturer. Reversible design provides two useable wear edges doubling the life. Urethane quality blade at rubber pricing! Reduce truck downtime because you don't have to change the edges as often - Cut maintenance costs. Eliminate plow scrapping noise. Preferred by hospital and apartment complex snow plow operators. The Surface Saver’s urethane is the right material for the snow plowing application. It has been specially formulated to withstand the rigors of plowing with added abrasion resistance, and a brittle point of -30º. We offer single plow operations up to state DOT sized operations. Extremely durable material outlasts rubber and cheaper grades of urethane. Hard enough to break up packed snow and ice yet soft enough to provide a squeegee clean surface on roads or runways full of slush. Available sizes: 6”, 8”, 10”, 12” high x 1”, 1-1/2" or 2” thick. Standard lengths up to 144" long; longer lengths and different thicknesses available. Available with mounting slots (3/4” x 3-3/8”) or blank (without punches). Resists tearing and chunking, produces low frictional forces and reduced drag. 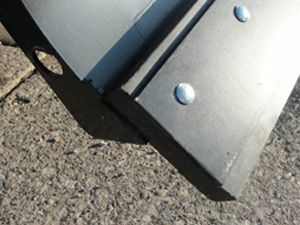 Urethane snow plow blades flex to absorb impacts and ride-over raised road obstacles, such as manhole covers, thereby reducing impact shock to both drivers and plowing equipment. Reversible design provides two useable wear edges for double the life. Urethane snow plow blade is flexible down to -30° C.
The Surface Saver Blades produce less friction than rubber blades, allowing higher snow plow speeds. Plowing airport runways, city streets, and parking lots provides unique challenges to winter maintenance professionals. The need to keep these surfaces clear of snow and ice must be balanced against the desire to minimize damage to the road surface and raised obstacles such as runway lights, reflectors, and manhole covers. The Surface Saver Snow Plow Blades are stiff enough to break through frozen snow and ice, yet flexible enough to absorb impacts with raised road hazards. Since the blade is helping to absorb the impact forces, plow driver safety is improved and equipment stress is reduced. The Surface Saver products set the highest standards for performance in the snow removal industry, offering exceptional service life in the harshest conditions. 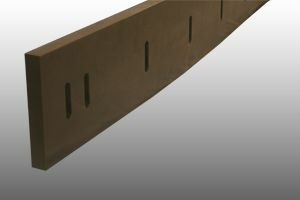 Designed to combat unnecessary downtime and maintenance, The Surface Saver’s specially-formulated polyurethane is site-tested to withstand temperatures to -30º below zero and is proven to outlast steel, rubber and plastic alternatives, as well as other polyurethane products in the industry. The Surface Saver blades have a five times higher abrasion resistance than rubber blades. Using The Surface Saver Blades made from a special formulated compound will reduce labor cost and downtime. Our new compound gives you urethane quality blades at rubber/neoprene pricing.